My notebook traveled between the Netherlands and Germany and underwent a motherboard replacement twice. The precious equipment is now back, and so am I. Let’s look at what the chemistry community has had to offer in recent weeks. In a communication to Journal of the American Chemical Society, Hisashi Yamamoto and co-workers at the University of Chicago reported a hafnium-catalyzed strategy to enantioselectively epoxidize the olefin group in tertiary allylic and homoallylic alcohols. The optimum reaction conditions involved 10 mol% hafnium(IV) tert-butoxide as the precatalyst, 11 mol% of chiral bis(hydroxamic acid) L1 or L2 as the ligand, and 20 mol% magnesium oxide as an additive. (See the scheme above.) 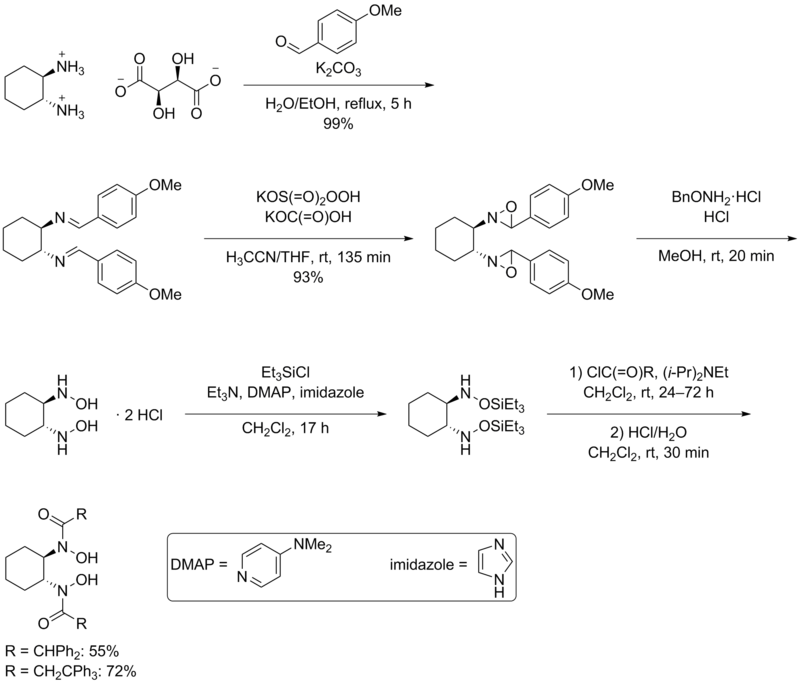 Acid L2 was excellent for more sterically demanding tertiary allylic alcohols. Cumene hydroperoxide (2 equivalents) was the oxidizing agent, and the protocol was performed in toluene at 0 °C for 48 hours. Various tertiary allylic and homoallylic alcohols could be epoxidized with high enantioselectivity in good yield. No such alcohols with a tri- or tetrasubstituted-olefin moiety were, however, tested. The chiral bis(hydroxamic acid)s were first designed by Yamamoto and colleagues themselves and can be synthesized from a readily available diamine tartrate salt in six steps. (See the scheme below.) Hafnium(IV) tert-butoxide, magnesium oxide, and cumene hydroperoxide are purchasable. Article: Olivares-Romero, J. L.; Li, Z.; Yamamoto, H. J. Am. Chem. Soc. 2013, 135, 3411–3413. DOI: 10.1021/ja401182a. Synthesis of chiral bishydroxamic acids L1 and L2: Zhang, W.; Basak, A.; Kosugi, Y.; Hoshino, Y.; Yamamoto, H. Angew. Chem., Int. Ed. 2005, 44, 4389–4391. DOI: 10.1002/anie.200500938.